I’d like to tell you about CHOMP, an app by developer, Fox and Sheep GmbH. I have previously reviewed Fox and Sheep’s Little Fox Music Box, which I LOVED, and Hat Monkey! 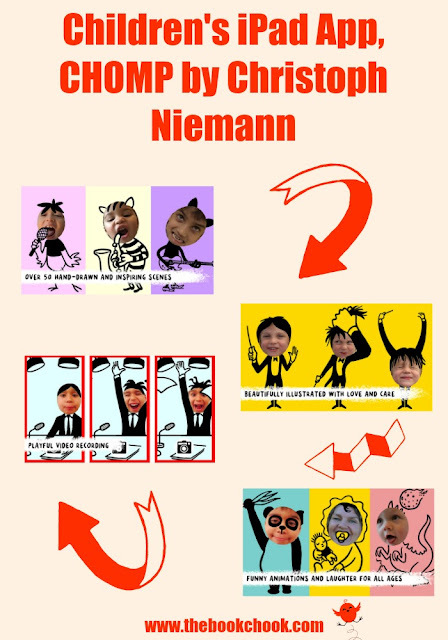 In a nutshell, CHOMP encourages kids to make very easy short videos with Christoph Niemann’s funky art work and their own faces. ‘CHOMP’ combines playful, humorous, and lovingly hand-drawn animations with realtime video, enabling children and adults alike to slip into a variety of comical roles. From a virtuous pianist, to a spaghetti-slurping dog, or a living cuckoo-clock, anything is possible! What makes this App so inspiring and special is that children participate using their own faces, mimicry, and song, allowing their creativity to run free. With the video functions, all of these adventures can be saved forever. ‘CHOMP’ is so easy and intuitive to use that kids can create and sing their own personal messages to send to parents, grandparents, friends, or siblings, all in the blink of an eye. The app provides a decent number of hand-drawn scenes and the animations are sure to appeal to a child’s sense of humour. It’s good to know the developer chose not to have ads, in-app purchases or data mining as that’s something many parents worry about. There are few directions and no text, but the visuals quickly guide users in what to do. I love that kids can record themselves along with the video - lots of storytelling possibilities here! I can also imagine the fun children will have by asking family or friends to be models for their videos. For educational purposes, I wish the app also allowed kids to take still pictures and save them to the camera roll. These could encourage further storytelling and writing of stories using that prompt. If kids know how to do screen grabs on the iPad, this would be a work around. I'll be adding this app to my list, Creating with Kids and iPad Apps. Gain an idea of the art work and the animation in this short sample video on Youtube.